The Dissolve: The Bridge opens with a shot of a bomb falling near an unnamed German town, and almost hitting a small bridge. It’s a near-miss, but the war has already touched the town, which is now nearly devoid of adult men. Only women and children are left behind to keep it running in the last days of World War II. Soon their ranks will thin as well, but for the moment, the teenage boys are making the most of it, becoming almost giddy at the thought that the war they’ve grown up hearing about is drawing so close to home—and at the thought of fighting for the German cause they’ve grown up believing is just and right. On a map, they second-guess the strategies of their country’s military. One initiates a sweet romance with a classmate. A few others find a cache of liquor hidden down by the shore. When their draft notices come, it seems like the beginning of another chapter in their ongoing boyhood adventure. 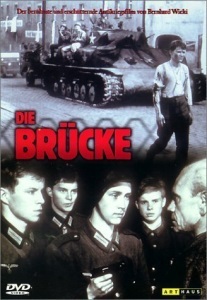 Senses of Cinema: The war situations depicted in The Bridge thus expose the abuses of authority that make such tragedy possible: not only the government and military but also, and far more damning, the parents, teachers and community that instill and exploit a naive, and easily manipulated, idealism in the young. The boys’ parents not only allow but also encourage such reckless sacrifice, in the name of a nationalist cause in which they themselves fervently believe – but for which they aren’t the cannon fodder. Their misguided, and unwittingly selfish, choices are vividly dramatised as the boys vicariously pay the price for their parents’ own desires. The boys are victims not of a nebulous evil entity called “war”, but of their families’ and communities’ ignorant and misguided beliefs. Aw man, this movie messed me up back when. Yeah, was shown this in High School, for German language class by the way, not History or whatever. Man, that was dark.